In this post, we ranked the best-selling broiler pans on the market. In today’s health-conscious age, broiling should be an increasingly popular cooking method. For many, however, implementing a healthier cooking alternative to frying, is a tough task. If you’re looking for a healthier cooking method, consider forgoing frying. Frying adds calories and fat to your food, increases your risk of coronary artery disease and weight gain, and instead opt for broiling instead. Apart from being heart-healthy and diet-friendly, broiling is cheap and fast too, which perhaps explains its growing popularity. 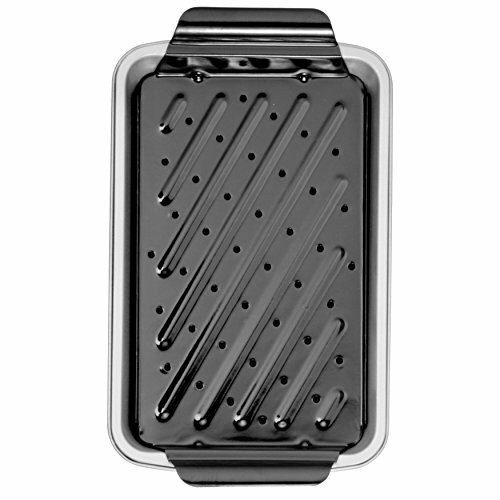 And once you have decided to broil your food, a broiler pan is what you would need (Source). Before buying a broiler pan, you should have a clear idea about why you want to possess one. Just because everyone else is buying shouldn’t mean you too should go ahead, get one and then forget all about it. So, first things first: why you need a broiler pan? To answer, it would speed up your cooking process, need less oil, and let you reduce the natural fat present in your meat or fish, which would melt during broiling and drip into the broiler pan. Once you have finished cooking, you can discard these fat drippings. Though different materials could be used to build your broiler pan, the typical ones are carbon steel, ceramic, cast iron, and stainless steel. Though all these materials can handle the task of broiling well, they have some specific properties that suit particular recipes or foods the best. For instance, stainless steel can help you make great roasts, while a recipe requiring heat to be distributed evenly across its surface would be best done in a cast iron broiler pan. If you don’t want to spend your precious time scrubbing your broiler pan away at the sink, investing in one that’s dishwasher safe would be a good bet. Even when you can do without a dishwasher safe cookware, it’s prudent to read some user reviews before buying your piece to ensure you get one that’s easy to clean and maintain. The type of food you plan to cook is another important factor to consider. 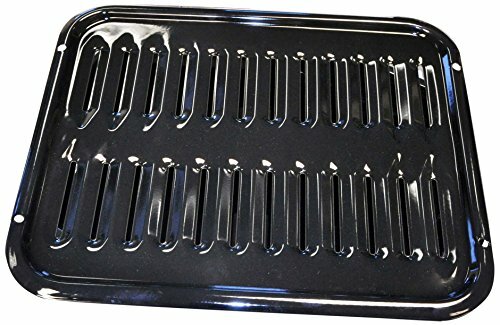 If you want to cook meat most of the time, buying a broiler pan that comes with a grill-style rack or has a grate with wide open slits to make the drippings pass through them easily would be a prudent choice. In case broiling vegetables is your priority, opting for a pan having more surface area on its top rack would be a good idea. Before you buy a pan, you should make sure of the dimensions that would fit into your oven. It would be ideal to measure your oven’s dimensions first, and then buy a pan whose size would comfortably fit into it. Broiling is a cooking method that uses dry heat (typically generated by a heat source located above the food) to produce intense heat. A broiler pan is a rectangular piece of cookware, which you can use to broil your food. It’s ideal to cook food that’s relatively thin via broiling so that it doesn’t get charred by the intense heat. According to expert cooks, broiling would work well for beef steaks, chops, fish steaks like swordfish and tuna, skinless chicken etc. 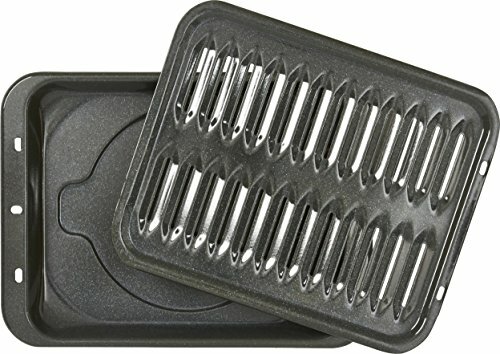 he pan has two sections – an upper cooking surface, which is the lid of the broiler plate; and a low walled pan section. The cooking surface holds the food while it broils, and has small holes or open slits on it, while the pan below comes handy to catch the drippings. Since the lid or cooking surface comes equipped with only nominal openings, it keeps the drippings and hot grease enclosed within the pan, thus ensuring they don’t explode and burn the food’s bottom section as it broils. You should preheat the broiler pan before your food goes into it. Doing this would give your food a blast of heat as soon as it goes in. For foods such as steak, preheating the pan would give it a delicious searing effect. To ensure your food is cooked evenly, you should bring it to room temperature prior to broiling. In addition, remove moisture or marinade from it, if any, by patting it dry before you set it to broil. With broiling, you should remember that you are actually just cooking your food’s outer surface. That’s why this method works the best with fresh vegetables that cook fast, thin cuts of meat, and foods that are moderately tender, to begin with. Since broiling is a fast cooking method, it would take at most 5 to 10 minutes to get your food ready. If you don’t keep a close eye on your food, and perhaps even check it every 2-3 minutes, it may go from being nicely seared to a disastrous charred variety. So, you shouldn’t walk away once your food is in the broiler pan. You could even set a timer at 2-minute increments to remind you of checking how well the food is done. If you find the food browning too quickly or too slowly, you may even need to adjust your pan’s position a bit lower or higher respectively. Remember to stay away from using glass casseroles or dishes while broiling as the glass isn’t designed to endure extremely high temperatures. Though grilling is quite similar to broiling, the main difference is that the heat source here is positioned below the food, unlike broiling where the heat source is atop the food. During grilling, the food gets cooked by the heat generated from an electric element, charcoal, or gas. Another key differentiator between broiling and grilling is that while the former makes use of intense heat at all times, you can use variable heat for the latter – from low to moderate to high, depending on what your food needs. While broiling is a high-intensity, faster cooking method, baking is a lower-intensity, slower cooking method. 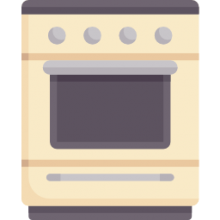 During baking, an electric element or a gas flame heats the air. This heat is then transferred to your food. Depending on what results you want to achieve, you can bake at low or high heat (Source). While high heat would brown your foods just about as effectively as broiling or grilling, you may even use low heat for slow cooking of thicker and larger items like long-cooking, tougher cuts of meat etc.